This split level, high ceiling bright and airy apartment has a number of stunning features so desirable in Notting Hill rentals that it’s likely to let fairly quickly. With blonde hardwood floors throughout the living space, there is ample room on the second floor for a formal dining area while leaving enough room to still have the look of open, sparse and minimalist design in your style of furnishings. The attached open floor plan has the kitchen corner in front of immense windows that stream in enough natural light to maintain that wide open feel. With four different countertop spaces and adequate storage around new stainless steel apartments the high-end look is a natural conclusion. Living quarters on the bottom floor have that same amount of expansive space so as to accommodate oversized furnishings should you wish. The wall of the front of the entire floor is nothing but huge bright windows which add a warm and cozy feel to this uninhibited space. The high ceilings keep the space from visually confining any modern design you intend to institute within your Notting Hill rentals selection. 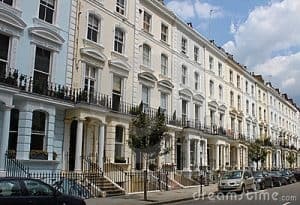 While it’s true that there are a number of Tube stations in the area, most conveniently is the Ladbroke Grove Station, two blocks north to Westway, what you might find more convenient is the Portobello Market of equal distance to the east. Around the corner from that on your way back to your area of Notting Hill rentals is the Electric Cinema and eclectic and fun venue with new features each fortnight. Or perhaps you’ll pass on the market and pop into E & O for some Asian fare and cocktails. Certainly, you’ll have much to choose from with the location of this high-style and centrally located Notting Hill rentals apartment on Cronwell Crescent.